Tuesday night’s episode of Agents of S.H.I.E.L.D. happened to be the 50th episode of the series, and boy, did it not disappoint. Before I jump into my recap, check out this touching video of the cast sharing their favorite episode moments! Together, MockingMay head out to track down Strucker in hopes of finding Ward. 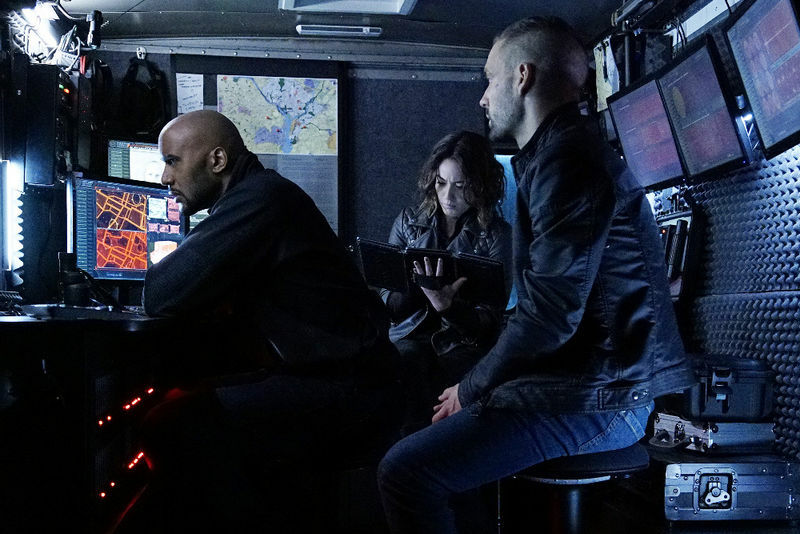 The new jet looks super slick, and, with the help of Fitz, they find Strucker’s safety deposit box and use their spy skills to go undercover to see if what’s in the box can get them to Strucker. While in the safe, they set off an alarm, and, while Bobbi prefers to try to settle things diplomatically with the guards, May prefers to get right to punching people. After they get the info they need from the deposit box, they get back in the air to track down Strucker again. Back in the jet, May confronts Bobbi on her hesitation to fight back in the safe and says that she’s more experienced now because of what happened to her at the hands of Ward. It’s a powerful scene that explores more of May’s tender side and her concern for those she trusts. 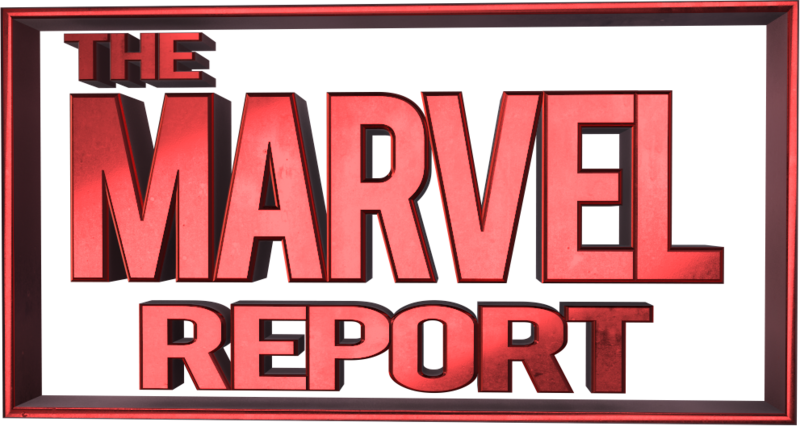 They find Strucker who is being tortured by Hydra thugs, and the two Shield agents infiltrate the Hydra party to get to Strucker before he dies to get the information they need on finding Ward – more on what Strucker reveals in a little bit. Poor Hunter. He’s feeling dejected and rejected since he’s been kicked off the Ward assignment, so he volunteers to help Daisy and Mack when they think they have a lead on figuring out the identity of Lash – Agent Banks (Price’s right-hand man) from the ATCU. Hunter gets criticized a lot in this episode, but it’s more light-hearted than anything, especially from Mack and Daisy. The three of them track down Banks and Hunter “apprehends” him and brings him into the van. In order to determine whether or not Banks is an Inhuman, they need a blood sample. Hunter punches Banks’ unconscious face to draw blood, and they send the blood sample to Simmons back at HQ, who happens to be in a session with Andrew – who seems to be healing up rather nicely. The tests that Simmons does determine that Banks is NOT Inhuman, which means that he’s obviously also not Lash. They put Banks back in his car and follow another lead they got while searching his phone. They wind up at a strange facility and release the newest DWARF that Daisy admits she still from Fitz. The DWARF captures footage of an Inhuman being delivered to the facility in what seems to be in a coma. The DWARF also captures footage of Coulson and Rosalind watching the delivery, which makes the team uncomfortable. Coulson is holding Price to her word about the whole “sharing information,” thing, but while they’re on their way to the ATCU facility, Price gets a call about an emergency – her home’s been (conveniently) broken into. Coulson talks his way into tagging along, and while Price speaks with police, he takes a peek around her place and learns that her furniture is brand new, she has a nice baseball bat, and she loves Margaret Thatcher. Later, Price sets two bags from DJ’s Burgers on the table for dinner and Coulson confronts her about all of this being a set up to distract him from their trip to the facility. She finally agrees to take him. At the facility, Coulson and Price watch the delivery of the Inhuman that Mack, Daisy, and Hunter are also watching. Coulson questions Price on what it is that she’s doing, and she informs him that the Inhumans are completely safe – they’re in what’s like a medically induced coma to keep them safe until they can find a cure for them. She also reveals that her husband died from cancer and that she wishes she could have done the same to him until a cure had been found. It’s a nice scene between the two directors, and it gives Price some humanity and much-needed depth. Okay, y’all, I did not see this coming. When May cuts Strucker down from the cuffs, he reveals to May what really happened when he was sent to take down Andrew. Strucker says that he saw Andrew transform into a monster and take down the Hydra team. That’s right, folks. Our beloved Dr. Andrew Garner is, in fact, the Inhuman that Daisy’s been looking for. May’s reaction to the news is tragic, as seen in her distraught facial expression. This reveal is definitely shocking, and makes the tag scene even more chilling when Andrew is seen eavesdropping on Daisy’s phone to call to Lincoln. What’s next for Lash/Andrew? It seems like we’ll get to see some history between Andrew and May in the next episode but a few questions remain: How long has Andrew been Lash? Who is he working for? What’s his motive? What does this mean for the rest of the team when they find out that one of their most trusted advisors is also a threatening force to be reckoned with? Tell us your thoughts on tonight’s exciting 50th episode of Agents of S.H.I.E.L.D. in the comments below! “Chaos Theory” – As Daisy and the team fight to protect Inhumans, S.H.I.E.L.D. discovers the shocking truth about one of their biggest foes. Meanwhile, Fitz helps Simmons recover information that could lead them back through the portal, on “Marvel’s Agents of SHIELD,” TUESDAY, NOVEMBER 10 (9:00-10:00 p.m., ET) on the ABC Television Network. “Marvel’s Agents of SHIELD” stars Clark Gregg as Director Phil Coulson, Ming-Na Wen as Agent Melinda May, Brett Dalton as Grant Ward, Chloe Bennet as Agent Daisy Johnson, Iain De Caestecker as Agent Leo Fitz, Elizabeth Henstridge as Agent Jemma Simmons, Nick Blood as Agent Lance Hunter, Adrianne Palicki as Agent Bobbi Morse, Henry Simmons as Agent Alphonso “Mack” Mackenzie and Luke Mitchell as Lincoln Campbell. Guest starring Constance Zimmer as Rosalind Price, Matthew Willig as Lash, Juan Pablo Raba as Joey Gutierrez, Powers Boothe as Gideon Malick, Jack Guzman as S.H.I.E.L.D. agent #1 and Kyle Russell Clements as S.H.I.E.L.D. agent #2. Jonathan was first introduced to superheroes and comics at a young age and quickly fell in love with everything Marvel. While in college, Jonathan did many projects about the representation of women and minorities in the media and in the Marvel Universe. Jonathan loves Marvel films, specifically the X-Men franchise and all of the intricate MCU. Jonathan's favorite characters are Nightcrawler from the X-Men and Black Widow from the Marvel Cinematic Universe.